Valentine’s Day is tomorrow (in case you didn’t know). If you want to make something for your sweetie, child, coworkers, mailman, or just for yourself these are the perfect no fuss Valentine’s Day dessert. I think decorating sugar cookies are so much fun, and it is something I want to get better at doing. 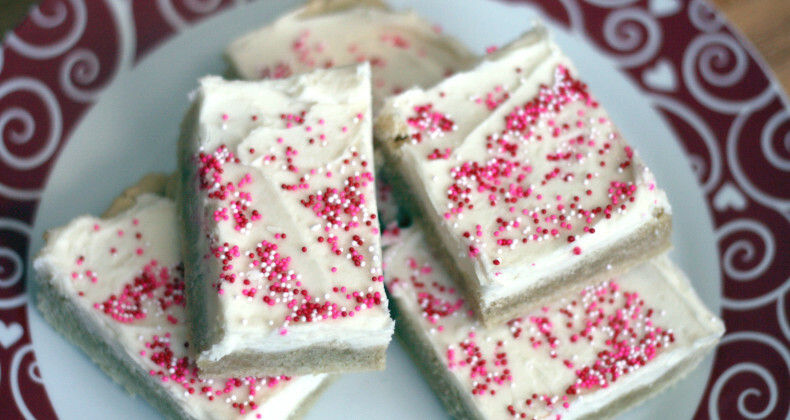 But maybe rolling, cutting, baking, coloring icing, flooding cookies, and piping pretty designs on to something that will be quickly gobbled up isn’t your thing then these bars are the answer to your low hassle sugar cookie desires.Â You get the wonderful sugar cookie and frosting flavor in a simple bar. Preheat oven to 375 degrees F. Lightly grease a 10 x 15 inch pan. In your mixing bowl cream together butter and sugar on medium high until light and fluffy about 2 minutes. Turn mixer down to medium-low and add the eggs, one at a time, making sure to mix well. Add the vanilla and almond extracts. Turn mixer down to low and slowly add in the flour, salt, and baking soda. Mix until just combined -careful not to overmix. Press into your greased pan. Bake for 15-20 minutes. You want your tester (a toothpick or knife) inserted in the middle to come out clean. Allow to cool completely before icing. In the bowl of your standing mixer fitted with the paddle attachment, beat the butter until light and fluffy, about 2 minutes. Add the vanilla and salt, mixing well. Reduce the mixer speed to low and carefully add the confectionersâ sugar, one cup at a time. Add the milk and mix until smooth. If you want to add any food coloring you may do so now. Remember the coloring will darken over time. I recommend using AmeriColor soft gel pastes. They have great colors. Spread icing on top of bars and add any sprinkles or candies.